Bowen College has launched a new site showcasing the pain elimination method known as BowenFirst Therapy. It uses cross fibre stimulation to talk to the nervous system and relax muscles, increasing circulation and decreasing inflammation. 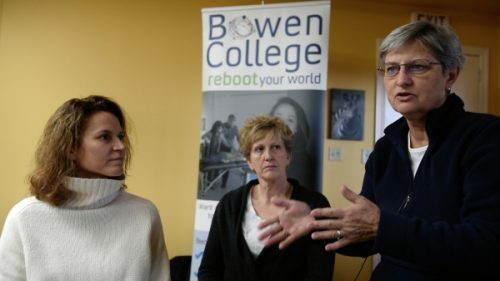 A new site has been launched for Bowen College, the home of professional Bowen training in Canada. It is the first accredited Canadian school to offer the comprehensive training necessary for them to practice Bowen Therapy, which is one of the most powerful and impactful healing modalities in the world. BowenFirst Therapy is a relatively little known pain elimination method that Bowen College is encouraging more people to learn about. It is safe, gentle and effective, using a cross fibre stimulation method to relax the muscles and increase circulation. Dr Manon Bolliger is now focusing on expanding the reach and accessibility of the therapy worldwide through high quality training. Her vision is to encourage people to understand that all healing starts from within, connecting to the body and the amazing things it can do. She aims to train practitioners worldwide so that they can help people to foster empowerment and personal agency in the fundamentals of healthcare. With many people suffering from pain and taking pain medication, she explains that it’s time to work with the body rather than against it. The BowenFirst Technique is a body manipulation therapy that uses gentle pressure to stimulate the brain to reboot the body. Using thumbs and fingers, the practitioner uses rolling type moves on precise points to activate nerve bundles below the muscle. This leads to a gentle, subtle and relaxing healing sensation. By stimulating meridian points in a specific order, the technique encourages the body to reset, repair and balance itself. The new site explains that this makes it one of the safest, fastest and most effective modalities for treating pain, chronic illness and improving overall health. The treatment gets the body to reboot, restarting the different programs within the patient, and integrating mind-body connections. A typical treatment takes approximately an hour, during which the practitioner will perform a series of autonomic integrating moves, and time will be set aside so that the nervous system can communicate the necessary information through the body.